I love watermelon! This may not come as a surprise to my friends who know me well, or those who got to the fruit salad buffet late after I had picked all the delicious watermelon pieces out – every day. One of my earliest memories of childhood is sitting outside in the warm sun and having a watermelon-eating contest with my brother. I’m pretty sure I won. With summer approaching and with the day’s getting longer and hotter, I thought I would share some amazing facts about watermelon, why it’s so good for you and why you should cut one open today!! Citrullus Lanatus otherwise known as watermelon is believed to have originated in the Kalahari Desert of Africa. Egyptian hieroglyphics on the walls of depicted the first watermelon harvest nearly 5000 years ago. Watermelons were often set in the burial tombs for nourishment in the afterlife. 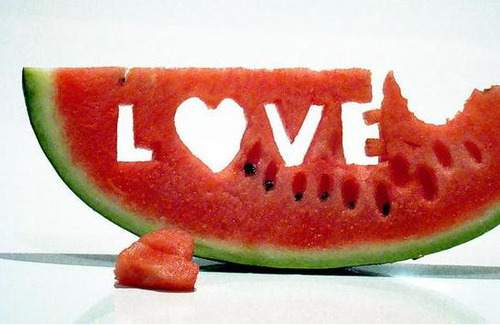 From Egypt, watermelon spread throughout the Mediterranean Sea, by merchant ships. Eventually watermelon’s made their way to China in the 10th century, which today remains the world’s number one producer of watermelon. Watermelon is recommended to help handle the heat of summer. It helps to cool you off and hydrate you. The fruit is low in calories and contains many nutritious benefits such as lycopene. Lycopene is a powerful antioxidant (also found in tomatoes), which has been shown to help prevent cardiovascular disease and some forms of cancer. 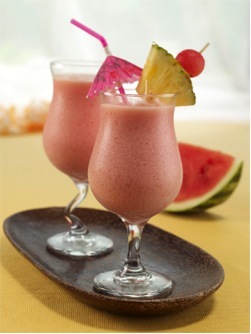 Watermelon also contains high amounts of Vitamin C, Vitamin A and Vitamin B6. Vitamin C can give the immune system a boost against viruses and bacteria invading the body. It also helps prevent premature aging by protecting you from free radicals. Vitamin A is important for healthy eye function and also helps lymphocytes in the body, which are infection-fighting white blood cells. Vitamin B6 helps the body produce antibodies to help the immune system fight diseases. Vitamin B6 also helps maintain normal nerve function and helps to form new red blood cells. Watermelon has a high potassium content as well. Due to this fact, watermelon will originally quench your thirst, but over time the potassium will act as a diuretic, to help flush any toxins out of your body. Combined with the beta-carotene in the watermelon, this will give a cooling anti-inflammatory effect to help flush contaminants through the urinary tract. 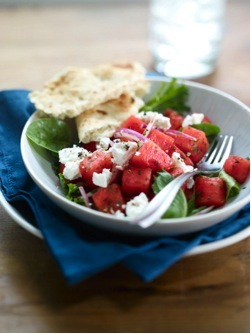 I have included some recipes to use with your watermelon this summer! Happy eating!! Blend until desired consistency and serve. For an adult version add rum! Makes 4 to 5 cocktails. ← Happiness – How To “Get” It and Keep it!